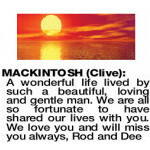 MACKINTOSH CLIVE Passed away 21.3.2019. 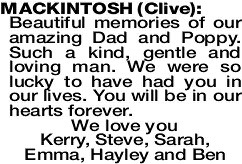 Dearly loved husband of Beryl, loved father of Kerry Rod and Greg, father in law to Stephen and partners Dee and Annita, loved poppy to Hayley Emma and Sarah and Ben. 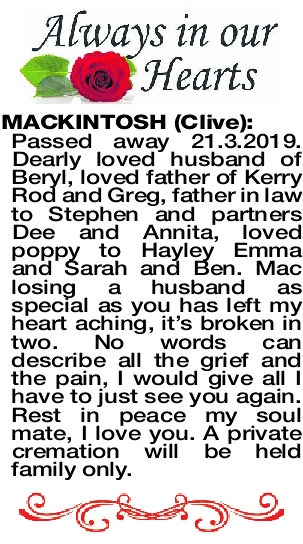 Mac losing a husband as special as you has left my heart aching, it's broken in two. No words can describe all the grief and the pain, I would give all I have to just see you again. Rest in peace my soul mate, I love you. A private cremation will be held family only. 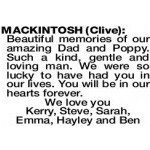 MACKINTOSH CLIVE Beautiful memories of our amazing Dad and Poppy. Such a kind, gentle and loving man. 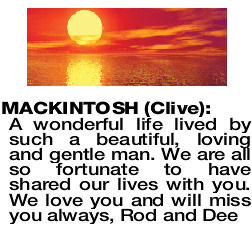 We were so lucky to have had you in our lives. You will be in our hearts forever.